Join us for this festive evening of Klezmer-infused music and you will be whisked away on a vibrant journey, following the trail of the klezmorim across Europe, then eastward to the moving sands and sounds of the Maghreb, and as far east as the Urals, where its soulful renditions of the oral traditions of the Balkans echo the tears of the dispossessed. Much Dancing is encouraged!! The instrumental creature known as Oktopus extends its creative tentacles across the landscape of East European music with an effervescent concoction of new and reinvented elements of the repertoire. The band’s exuberant harmony of bows, keys, valves and mouths strikes a chord in music lovers’ hearts, bringing pure joy to audiences in quest of memorable evenings, festive occasions and other momentous celebrations. The group was founded in 2010 by Gabriel Paquin-Buki, who from, the outset, has signed dozens of arrangements from the traditional repertoire, as well as from classical, pop and Québécois music and who, more recently, has contributed, along with violinist Vanessa Marcoux, new compositions to the group’s repertoire. To see Oktopus perform live, whether in a concert hall, in a park, on a street corner or in a hot-air balloon, will transport you, transform you, entrance you, and enhance your desire to dance on and on. 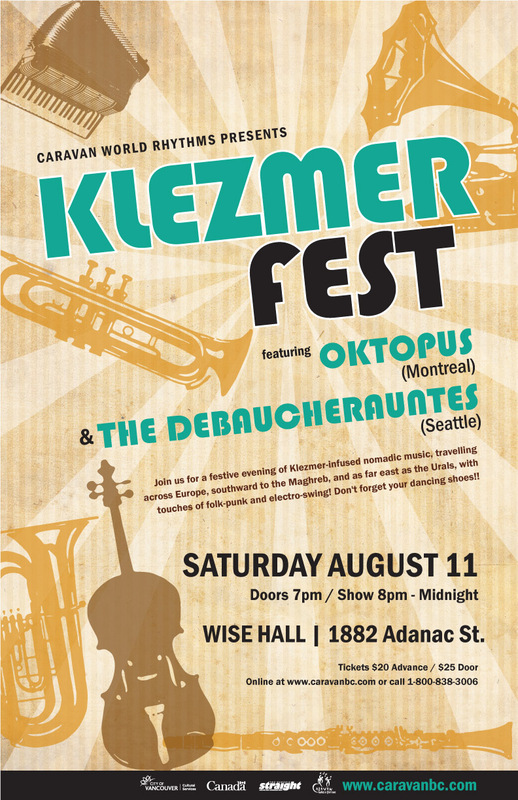 Seattle-based Klezmer fusion band The Debaucherauntes is known for their tilt-a-whirl tempos, neo-vaudvillian-esque tinged stage presence, powerhouse vocals, blistering solos, and earworm melodies ranging from hearbreaking to dance candy. Inspired by a diverse range of influences, from whiskey-soaked throaty circus ballads to triphop, folk punk, and electroswing, audiences leave with tired feet and a full heart.